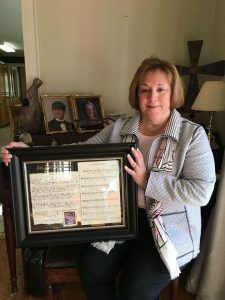 Mary Stubbs proudly holds a framed hymn arranged by her mother, Helen Robertson Aycock. The hand-written song was discovered while going through sheet music after Mary’s father passed away. Mrs. Aycock passed away in 1970 when Mary was 10 years old. The discovery of this treasure allowed Mary and her brothers to experience their mother again. With the assistance of Bob Taylor the hymn was sung as the Introit on Sunday March 24, 2019. To God be the Glory!! !